I think some people will be surprised to learn that rat/rats, fancy pet or rattie/ratties/ratty, gerbil/gerbils, hamster/hamster (dwarf too) rabbit/rabbits, ferret/ferrets, yes, many small animals, including but not limited to chinchillas Guinea Pig/Pigs (Cavy/Cavies) are doing and are learning to run an Agility Course set up much like a dog or cat agility course would be. PLEASE NOTICE THAT WE HAVE SISTER SITES FOR MANY SPECIES OF ANIMALS. IF YOU CLICK ON ONE YOU WILL FIND INFORMATION ON THAT TYPE OF ANIMALS. HAVE A LOOK, WE HAVE PHOTOS, IDEAS, CARE INFORMATION, AND VIDEOS. I think that people sell small animals short. Most think that a small animal is a cage flower. A pet that lives in a cage that you look at and in a few months becomes a chore to clean and to feed. Shame, because small animals offer so much more... if people just knew. That is really what this website is about. For people to find out "What can I do with a (fill in the blank) small animal?" 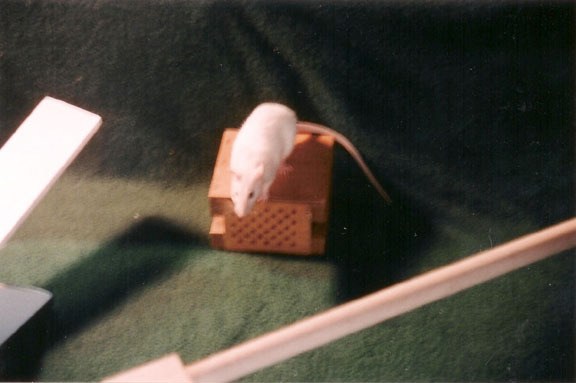 Many small animal types are doing agility on little bitty, usually home made agility equipment. Several people are now teaching their small animals tricks and tasks. Did you know that Dog Agility is not that old of a sport? It was fabricated after Steeplechase that horses do. Llamas and goats have been doing Agility called obstacle Courses at shows for years. 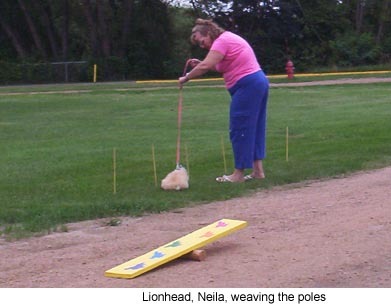 Cats have Agility Courses also with smaller equipment then dogs....so small animals, why not? Rabbits and Ratties even have competitions for Agility. You Tube has some cute videos of many different types of small animals that are running Agility Courses. What is the "trick" to teaching an Agility Course to a small pet? Time spent. That's right, spending time with your small pet. Teaching it to learn. The more time you spend with your animals the more time you and the animals will want to spend together. 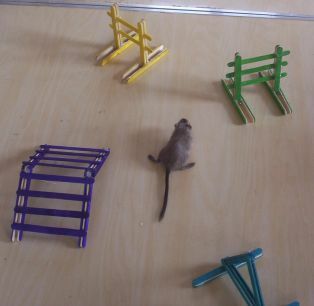 We are now working with our gerbil on an agility course....as well as our mouse and a couple of hamsters. Even children can train small animals. 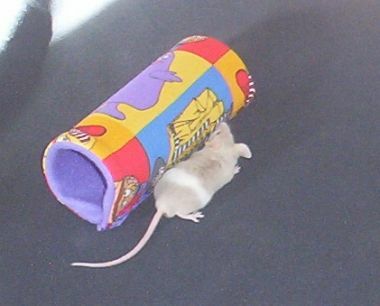 My step sons taught Gerbils to run an Obstacle Course when the boys were young. It did not take much to teach them. Again, I was surprised how easily the animals learned. In just a few sections, the gerbils ran the course and the animals and the boys had a great time. The thing is, the boys spent a lot of time with the gerbils doing nothing, just holding and playing with them before they taught them to run the course. Can anyone train a small animal? Well? Yes. Anyone with patience and a love for animals I believe can. Where can you get small or even little bitty equipment? Most people make their own equipment, just make sure that what you make or use is stable for the animals weight. Make sure it is safe for the animal. Make sure that the animal is having fun while you train. 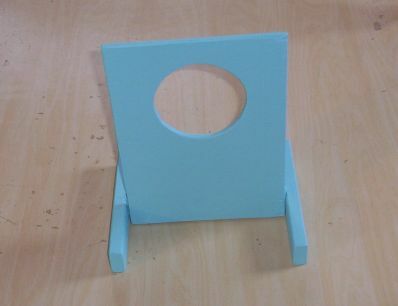 We do also sell some agility items here for small animals. Can you use rat sized equipment for a mouse or a chinchilla? Not really. The equipment really needs to be the correct size. The rat equipment would be way too big for a mouse and a bit too small for a chinchilla or a Guinea Pig. Some rat equipment could be used for a degu. Hamster equipment could also be used for gerbils....just make sure what ever you use it is safe for the animal. 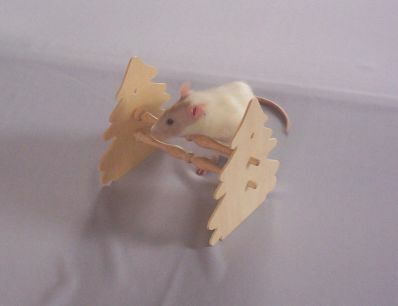 I have seen and now own Mouse Agility Equipment and boy is it cute!! 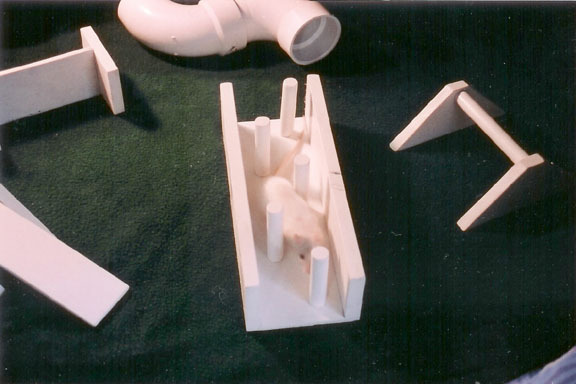 I have seen people use the Breyer's Dog Agility Equipment set for mice. 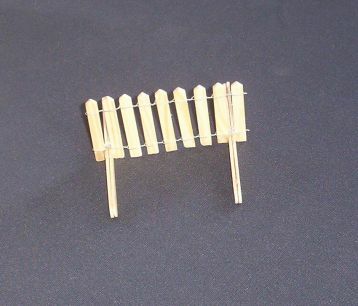 I have seen toothpicks used to make mouse equipment. The ideas are endless. Legos, or locking blocks can make some good jumps for small animals. 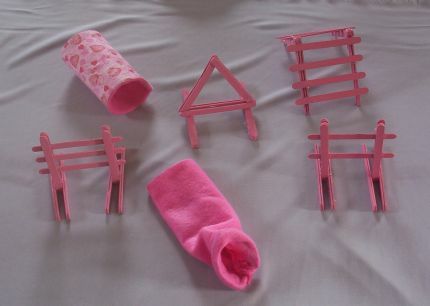 However, the blocks would be too light for some of the different animal's equipment. Remember that small animals tend to "walk" on the jumps and other equipment so whatever you use it must be able to hold the animals weight without falling or breaking. The contents of this page for Small Animal Agility is still under construction. Please check back often. We do however have Rat/Fancy Pet Rat/Rattie Agility Equipment as well as Hamster/Gerbil Agility Equipment and Rabbit Agility Equipment, Mouse/Mice and Guinea Pig/Pigs, Cavy/Cavies ideas and photos below....come on scroll down to see. More will be added very soon. I would like to invite you to join Yahoo Groups eLists that I host at the Yahoo Groups site. Come "talk" to folks that are training or are interested in training their animals....ask questions, share ideas. Agility really is fun for any animal. I also have websites set up for Rabbit Agility and Rabbit Hopping or Jumping www.rabbitagility.com and also a website for Fancy Rat Agility at www.fancyratagility.com or www.theagilerat.com At these site you can read how to start your animals and ideas for Agility Equipment as well as other fun information. All equipment must be sturdy and safe for the normal use of how the equipment was designed. 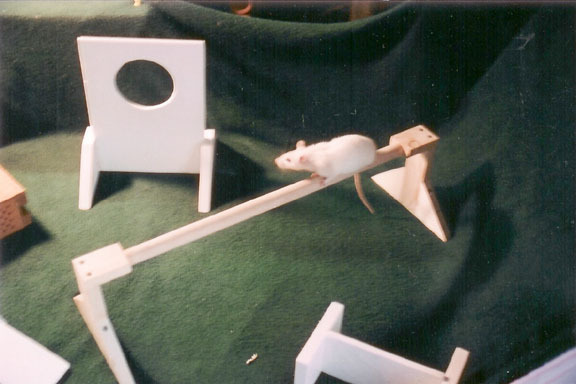 The agility equipment must be made to rat size and be painted or teated in a way that it can be easily cleaned between runs if necessary. Make sure all items are sanded so that there are no sharp edges. However, natural wood (including bark) may be used to design Rat Agility Equipment it may be sprayed or painted with varnish or shellac. Equipment is to be set up on a sturdy table (absolutely no wobbling) or two tables pushed together that are the same size. 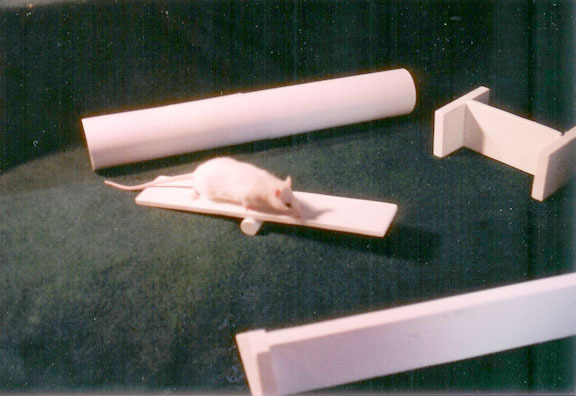 We sell Rat Agility Equipment Sets like this white one and larger sets at our Online Store. 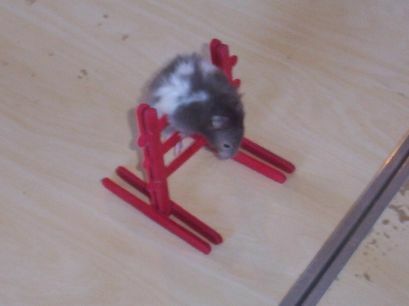 We sell Gerbil/Hamster/Mouse/Mice/Dwarf Hamster Agility sets. 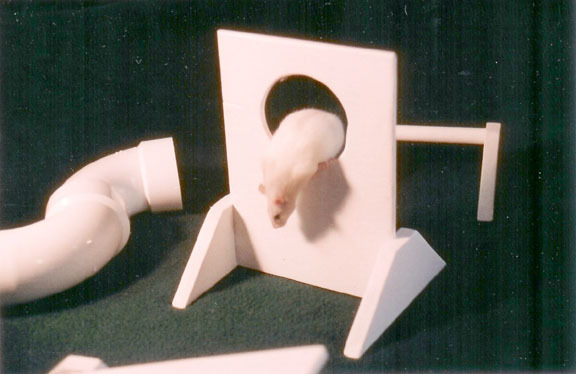 And we also sell individual pieces of Rat and other species of Agility Equipment. At the bottom of this page you will find some items that could be used for young rats, hamsters and or gerbils to learn to run an Agility Course. We will be adding photos and more ideas before long. This page is a work in progress. My husband and I are still coming up with new ideas for new pieces of equipment. Photos, sizes and ideas still coming, please check back often. You will need a hoop that is 6" to 8" in diameter. It can be made of wood, plastic or fabric. However, if it is made of fabric there will need to be four (4) replacement hoops for competition in case one or more rats pee on the fabric. 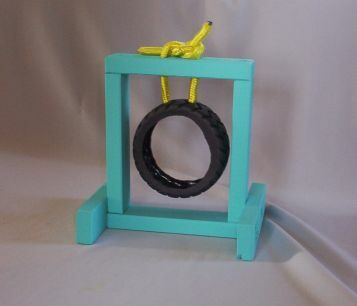 The frame holding the hoop can also be made of wood or plastic. 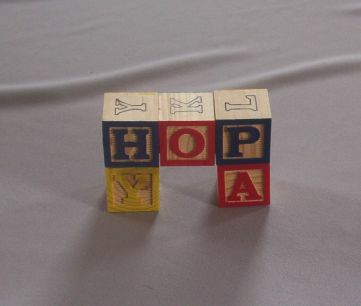 The frame will be " X " and made to be sturdy and very balanced so that it will continue to stand even if "hit" by the rat as the rat comes through the hoop. The Teater Totter is a smaller type Sea Saw. The top board is 16" X 3" and it pivots on a wooden dowel that is 3/4" in diameter and 3 1/2" long. The top board is secured to the wooden dowel by first gluing then tacking with small tacks from the board side down. Paint with non toxic water proof paint and decorate if desired. The Sea Saw is a favorite piece for both the owners of the rats as well as those watching the rattie run the course. Be sure to put safety first. The Sea Saw you use needs to be stable and break over (teeter) easily and quietly. 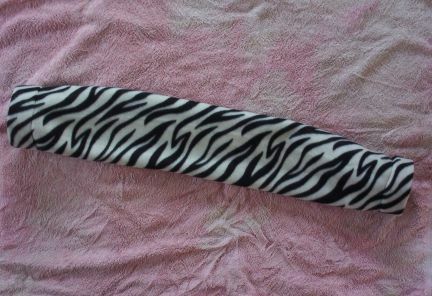 This one has a platform that is 20" long and 3" wide, it is attached to a stand that is 8" x 3" high. My husband made sure that it was both balanced and "feet safe" before painting it so that it could easily be cleaned thoroughly. The Wall Jump is a fun jump, rats take to it right away. It is also easy to make. This one is 8 1/2" long x 3 1/2" tall, the ends are approx. 5" x 3 1/2". It, like our other equipment is painted so that it can be cleaned easily. I have to laugh when I see this one.....it reminds me of a toilet paper holder. The Bar Jump is basically a stand, approx. 8 1/2" x 3 1/2" with a 3/4" towel cut to 6 1/2'. My husband screwed the dowel in and painted it white. The Stationary Bar Jump has a stationary bar rather then one that moves or is adjustable. This is a very stable jump. The rat coming over it is our rattie named The Ballerina. She is a Hairless Dumbo and has this amazing personality!! Bar Jumps can come in many shapes and sizes. 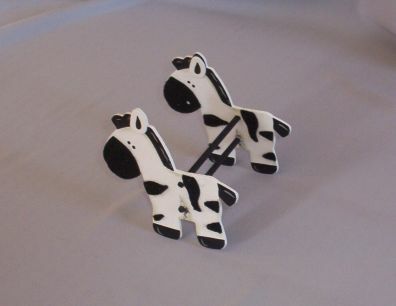 The important thing is that they stable and set at a fair height for the animal. Bar Jumps are usually where you will see all the cute designs on the course. 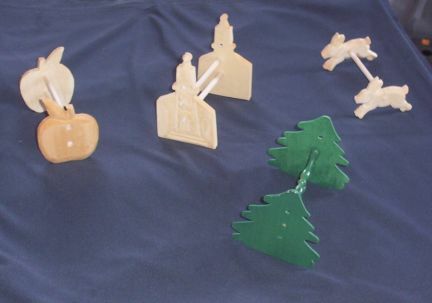 They are often made with cut outs and are painted with details. This one in the photo that Nineveh is coming over is now painted <grin> I took this photo while making sure that the jump was stable enough for a rats weigh. As you can see, this jump has two bars and three matching holes in each of the tree cut outs for adjustment. 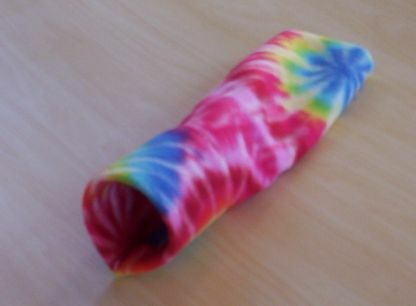 An Open Tunnel can be made of plastic, fabric over plastic or PVC. The size must remain consisting throughout the entire tube. with no collapsible parts. The opening must be a minimum of 3" and maximum of 5". It should be 12" in length. The outside may be decorated. This is an Open Tunnel shaped into an "S". It is a fun piece of equipment for both spectators and the rats. We like to use PVC piping for these, it is easy, cheap and easy to clean. We used two 90 degree elbow plumbing PVC pieces and placed them together. 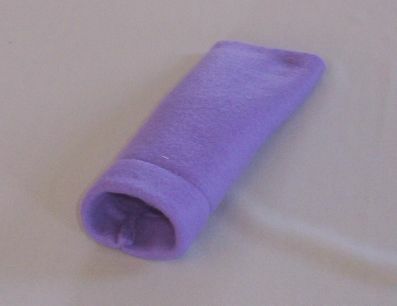 A Closed Tunnel can be made of fabric or "quiet" plastic, but it must be washable. If a fabric closed tunnel is used in competition there must be at least three (3) closed tunnels available for the rats to use. This is so that if rats soil one another can be used. The of the Tunnels surface must not be slick. A Closed Tunnel must have a "stiff" opening that is 4" to 5" in diameter with a 15" "drape" that is one piece flow. The drape can be sewed or taped but must be made into one piece. 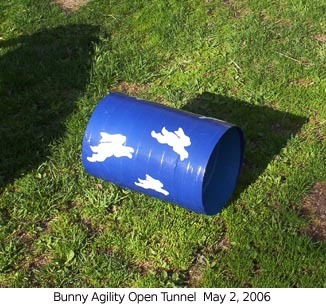 This Tunnel can be used in an Agility Course but is more of a training tool then an official equipment piece. 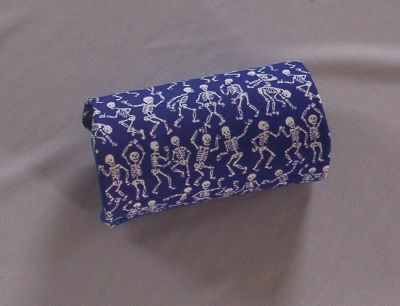 The Double Open Ended Closed Tunnel (DOECT) is approx 4" x 18", the middle area drapes like the Closed Tunnel would. 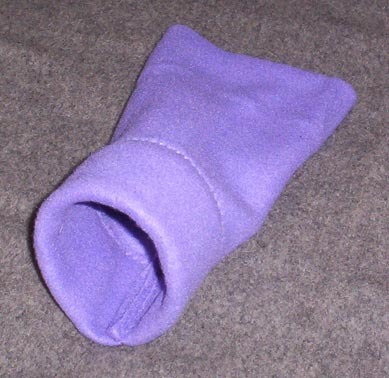 I made it with the same type good grade polar fleece. I was having trouble getting a young doe (Nineveh) to come all the way through the Closed Tunnel so I did two things. I made this piece, it has wider openings on each end but drapes in the middle section for her to use. This way she could see the opening and I could reach in if I needed to to "help" her on through. I also worked a bit more on the "Shoulder" command. This is where I put my hand down on the table/cage/desk and tell the rattie "shoulder" and they learn to run up my arm to sit on my shoulder. Between the double open ended tunnel and having my hand where she could see it at the end of the tunnel, she learned to come through the tunnel reliably. After you have the rattie coming through the Double Open Ended Closed Tunnel (DECT) you can switch the piece back to the Closed Tunnel or just continue to use the DOECT. I have seen Weave Polls made in several different ways. Some I like better then others. My husband and I designed this one and it works well for the way we train. I like that our Weave Poll piece has such a nice stable base. It will hold the ratties weight if the rat stands on either of the sides. You do want your Weave Polls to be very safe for your rats, if a poll falls, especially on a rat, it will/can scare a rat, this will set back all agility training for the scared rat. A Weave Poll set up should have five polls. The polls can be staggered or straight. The staggered polls can be set closer to one another then the polls are set in a straight line....obviously because of the ratties body style. Our set up is on a base that is 16" x 6". The 3/4" Polls are placed approx. 3" apart and staggered. The Turquoise set is my new set. My husband and I had this idea so that it could ship easily and still be simple/easy for the owner to put together and stable enough for the rattie to run. My young doe Nineveh learned to weave these polls in five lessons, that's it. The sixth time through she weaved away, quickly and by herself. I was pleased how quickly she caught on....and enjoys agility. You do need to make sure that your Weave Polls and any other equipment is painted or waterproofed so that if the rat would urinate on it the piece can be cleaned quickly and thoroughly. Our Balance Beam is 3 1/2" tall and 22" long. It is made of pine wood. Our ends are made large enough (8" at the longest part) to be stable for the ratties weight. We have painted ours white, but any waterproofing (for pee) so that it can be easily cleaned is a good idea. Again, this was designed for light weight shipping with attention to safety and stabilization for the rattie. 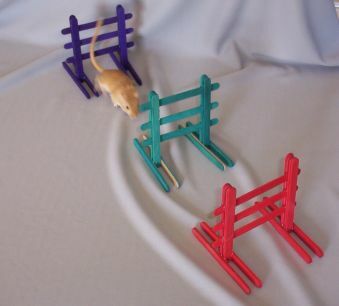 Deron, my husband made an agility set for our ratties to try before offering the same design for sale in our online stores. 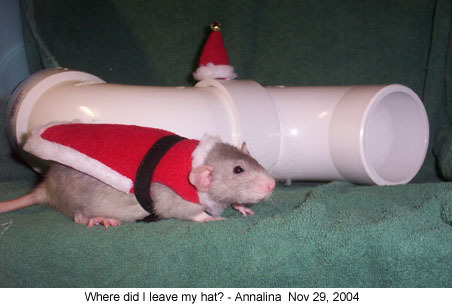 My rattie and other animals try out and use all the items we sell. We want to make sure you are receiving safe and fun items!! 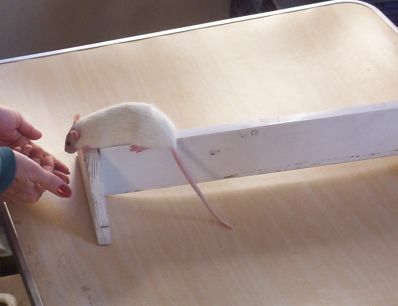 The High Beam Balance Beam is a bit higher and harder for the rattie then the regular Balance Beam. 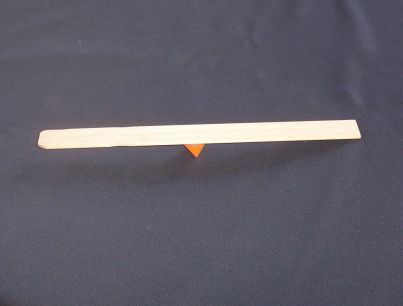 The High Beam Balance Beam is made with a 1" wooden dowel placed between two end piece stands. The High Beam Balance Beam is approx " long and " tall with a " x " base. Sugar, my first Agility rattie is the one pictured her. The Long Jump can be made in a variety of lengths. Most, for competition are approx 12". That said the overall size of the piece is approx. 20" so that the rests are attached securely to the base of the piece. 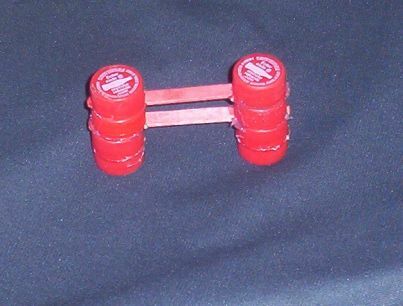 I recommend that the piece has an extra 4" x 2" piece that can be moved between the two ends for training. 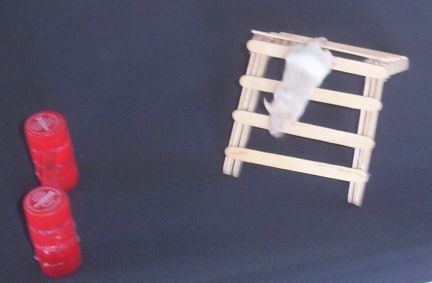 The idea being the jump is shorter to start and grows as the rat learns that you want it to jump between the rests rather then walk or run the piece. The pause table should be a maximum of 4" tall and the table top should be approx 6" X 6". The legs should be set to give the table the utmost stability. This one is just over 3" tall and just over 5" x 5". The Window Jump is a three piece wood item. The wood for the window to be cut out of is The hole for the rats to go through is 5" from the bottom/floor and 2" from each side. The hole itself is a 4 1/2" hole. On each side of the window a piece of wood cut to and glued and/or nailed to the window so that they are centered and will steady the window for the rat to climb, hop or jump through without knocking the piece over. The wood piece that the hole is cut out of is approx. 8 1/2" x 12"....and painted for easy cleaning. The turquoise (again) is made lighter weight then the white Window Jump and just a wee bit smaller. Both are stable so that the ratties can easily and safely climb through this cute piece. We sell the turquoise type in a set in our online store. This is a KOOOL piece and soon we will be adding a photo. You can use any type of wire that is strong enough when folded to hold a large fancy rats weight while climbing the piece. I used 1" x 2" wire and a piece that is 9" x 24". I folded the piece in half by bending it over a wooden stand. I then painted the piece and let it dry well (duh!!) before letting my fancy rats give it a whirl. This is a piece they LOVE!! You can smaller wire to make this piece. Make sure it is safe and not sharp and the overall size is large enough to be stable for the rattie's weight. You can use a small tire shaped dog toy for this. They come in many sizes, make sure you buy one large enough for a large fancy rat to got through. Build a frame for the tire and use cord to tie the tie to the frame. Make sure the frame has feet for stabilization of the piece so that the fancy rats can climb on it and the piece will hold even a large fancy rats weight. I love this piece. The piece started with Dog Agility and was/is so popular with not only the dog and owner but also such a crowd pleaser that most species have added it to their equipment line ups. This is Nineveh coming through our Tire Jump for the first time. The Ladder Walk is made easiest by buying 3 " parrot ladders at a local pet store. 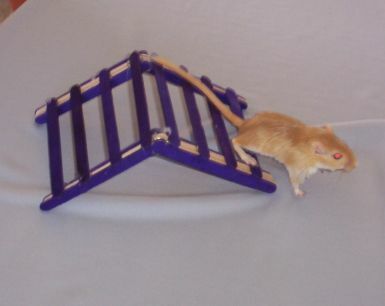 By connecting the ladders in a "U" shape (if you will) and adding stability braces at the bottom of each side so that the Ladder Walk is stable for the rattie to climb and run across. I am hav ing trouble finding the larger parrot ladders (within my price range LOL) to make one of these up. 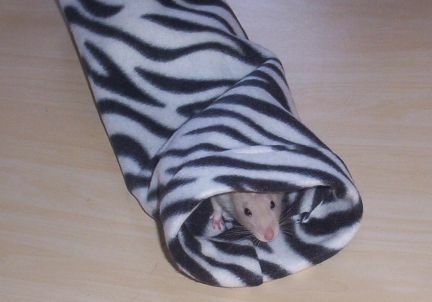 And when training and events are over, make a big fuss over your rattie and give it a few good treats, then make sure it has a nice warm comfortable place to sleep. 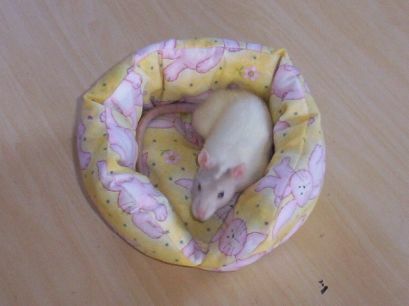 This is Nineveh, our doe rattie, she loves her rat bed. Hamsters and gerbils are basically the same size animals. They are however very different types animals. Even in how the move and sleep habits...different. So while they need the same basic agility equipment there are differences. Gerbils will jump more. They need to be trained to run the A Frames rather then jumping over them. A gerbil course should have more jumps on it then a hamster agility course. 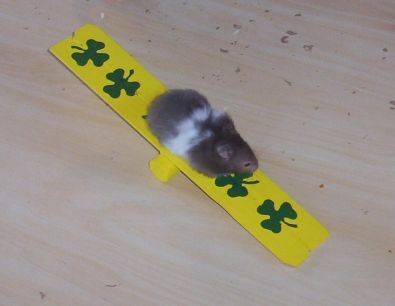 Hamsters do not have the long tail for balance and like a guinea pig should stay lower to the ground. hamsters will climb the jumps more then jump them and the A Frame may well be there second favorite piece of equipment...all the small animals love the Tunnels the best. You may find that training a hamster is different then training a hamster. But both will be easier to work with if they are food motivated. You might want to start working a young rattie. To do this safely you may need some smaller items to work them on. 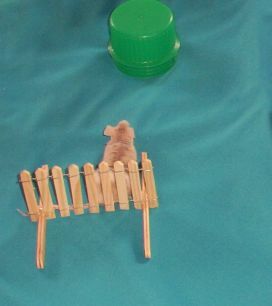 Here are some items we use to start the little ones....the items or pieces are also a great size for Gerbils and Hamsters to use for running a course. Please visit our sister websites www.gerbilagility.com and www.hamsteragility.com for more information and training ideas for these small and fun animals. The Tire Jump is a fun jump watch the animals come through. It was started with Dog Agility and the dogs and the audiences as well as the trainers had so much fun with this jump that you now see it with about any animal species agility. The jump needs to be stable enough for the animal to climb through. 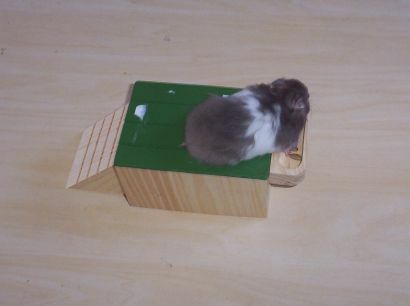 Most hamsters, rats, guinea pigs and other animals will climb this jump rather then jump through it. 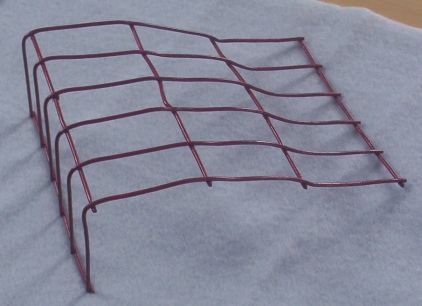 For this Wire A Frame you may want to use a smaller sizing in the webbing of the wire. These are two I use (photos coming soon). The first is apporox 8" x 5" and is bent over at the first "squares" of the wire. I have found this size to be great for teaching the young ratties for the first time on a Wire A Frame. This one I use for Rat training and is a good size for Gerbils or Hamster. It is approx. 10" long with an approx 4" opening in one end. 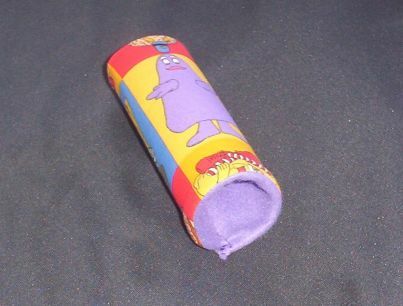 It is made with polar fleece that is washable. Bar Jumps are made two ways, the most popular has bars that fall off the jump if the animal bumps them as it goes over the jump. 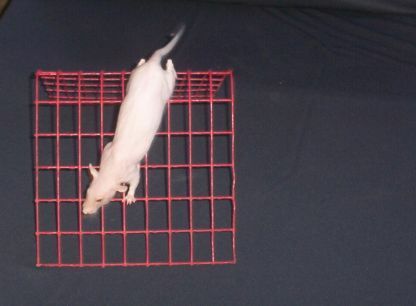 The bars fall away from the jump forward so that they do not hit the animals as they animal comes over it. 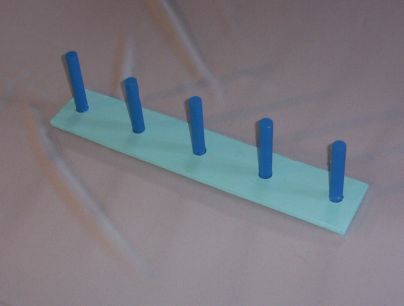 The photo shows Bar Jumps that have stationary bars. The bars do not come off if hit. These two Bar Jumps could really also be called Fence Jumps. The jumps as well as all of the agility equipment pieces need to be strong and stable enough to hold the weight of the animals as they climb, jump, run through or come over them. These are fun and cute and functional. 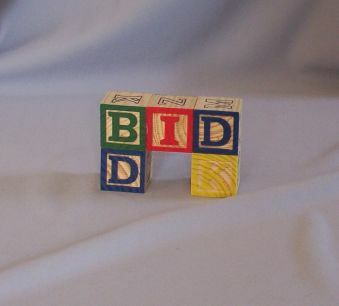 A Teeter Totter is also a really fun piece. The Tetter Totter has a shorter, easier pivot then the Sea Saw, and the Tetter Totter should be taught before teaching the Sea Saw. Make sure your base, or platform that the animal runs on is not only wide enough but also stable enough for the animals weight. The pivot, the piece under the Teeter Totter, needs to go from one side to the other (and past it is better) of the base so that the Teeter Totter will not tip over if walked or run on too close to the edge. The Pause Table can be many types of tables. It does need to be approx. twice the height of the animal. It needs to be very stable and able to hold the animals weight. The Pause Table can be a wooden box, a plastic box, a table with four or more legs (one at each corner set out far enough for the animal's safety when jumping up on the piece) or it can be any type of item the animal can climb, jump or pounce on. Where can you buy small animal agility equipment? 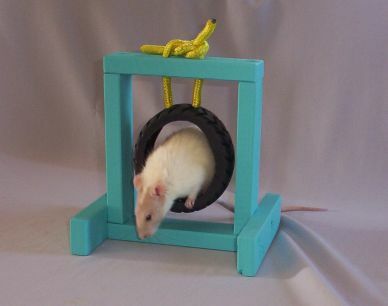 We do offer some rat agility items on our www.theagilerat.com site and will offer more items as we can. Check our Rat Items For Sale page. 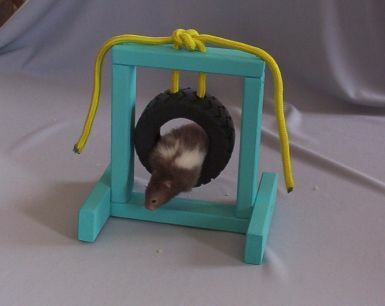 We also do have and will have more Hamster, Gerbil, Mice, Mouse, and other small animal Agility Equipment on this site, check the Fun Items For Sale page. We are currently working on items that we will be adding to our sales lines. We hope to have more Agility Pieces soon, very soon. This six piece set (including the plastic storage box the items come it) is a great starter set for gerbils, regular and dwarf hamsters, mice, mouse, a small or very young rat, rattie, rats. It comes with two Stationary Bar Jumps, one with two bars the other with three bars, a Triangle Hoop Jump, an A Frame, and a Closed Tunnel. Please check back often as this website is a work in progress. 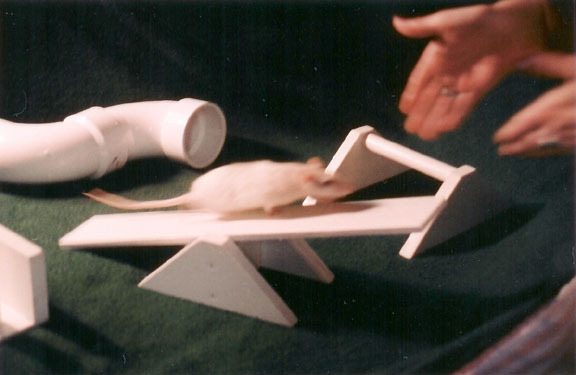 Mice can be easy to train for or to agility because they naturally run along a wall and run the same way each time. 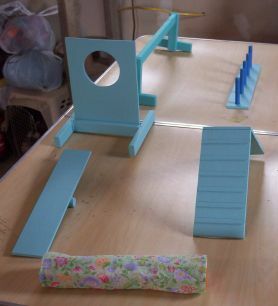 If you set your agility course up along a wall or make a short wall (books or wood or even using a sheet of paper to guide the mouse along the course) will help in training. I bought a mouse for agility training on March 3, 2008 and with a few short training sections he is now loving the time and attention and fun items of his new agility course. The equipment needs to be mouse size, not too big and not too small. It needs to be stable enough and safe enough for your mouse to run on and it not tip over or collapse on or with the mouse. Decorate to add a touch of fun and train away. Fence Jumps are a jump you will see on all Agility Courses. Agility, all Agility started with hoses and Steeple Chase, or Show Jumping. Horses run courses of jumps that are made to look like fancy country fences. This is also why some folks call all agility pieces "fences". And also many people call Agility "Show Jumping or Showjumping". 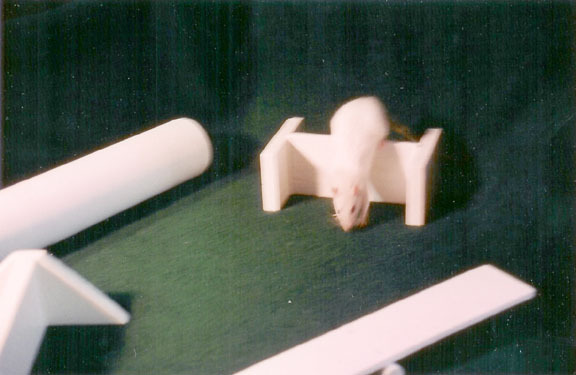 Bar Jumps are seen on most Agility Courses. Many of the Bar Jumps have bars or cross pieces will fall off the piece if the animal hits it when going over it. 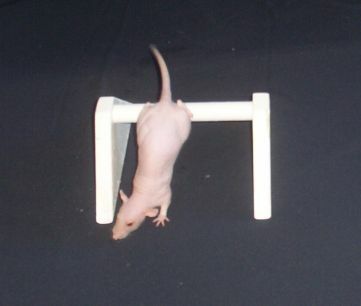 Many of the small animals do not jump the Bar Jumps, but climb over them. All agility items need to be stable enough to hold the weight of the animals. This is a fun agility piece. It stared with Dog Agility and because it was such a popular piece that you might just see it with any of the species agility. The Hoop Jump is much like the Tire Jump, but it has a hoop type item rather then the little tire. You also train for it the same way as you do the tire jump. It should be either plastic, PVC or fabric with a stiff center so that it can be cleaned. The Closed Tunnel is a fun piece for the small animals. They may require a bit more training then a jump....small animals love tunnels and many have to be trained to come out...they like to stay in them. The Teeter Totter is a fun piece. It has a lower pivot point then the Sea Saw and should be taught to the animals before teaching the Sea Saw. Remember when training your animals that it feels to them as if the ground is falling when it pivots, be patient. Most rodents do not have a problem learning this piece. 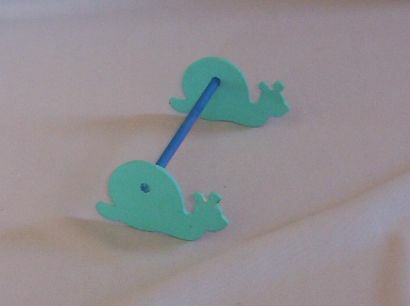 The Sea Saw is a cute and exciting piece. It is a favorite with owners and spectators. 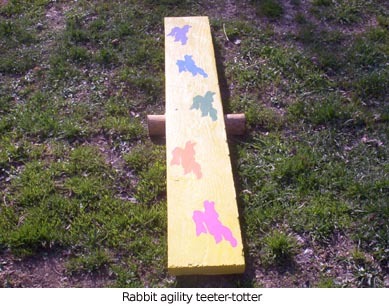 It has a higher pivot point then the Teeter Totter does and needs to be taught after the Teeter Totter is taught to the small animal. We will be adding more information and photos soon, very soon. We are working on this site frequently... please visit again. All agility equipment must be built sturdy and safe for the normal use of how the equipment was designed to function. 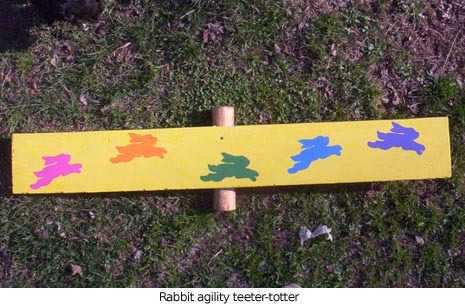 The agility equipment must be made the appropriate size for rabbits and be painted or teated in a way that it can be easily cleaned between runs if necessary. Wood items must be painted or shellacked so that if a rabbit were to urinate or defecate on it it could easily and quickly be cleaned between contestants. Make sure all items are sanded so that there are no sharp edges. Natural wood (including bark) may be used to design Rabbit Agility Equipment it must be sprayed or painted with varnish or shellac. At some events the equipment may be of different sizes. 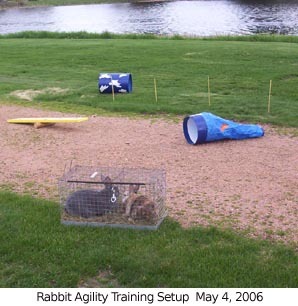 Because of the differences in rabbit breed sizes, some events may divide the groups into separate classes with different sized (and maybe even different types) of agility equipment. Agility equipment is to be set up within a barrier or fencing. 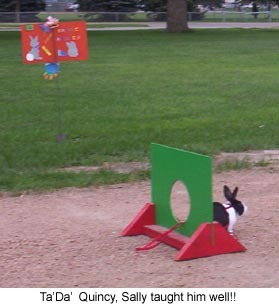 The entire agility course should be fenced with some type of barrier that will hold any and all breeds of rabbits. ie Small enough webbing for the smallest of breeds and high enough that the largest of breeds can not climb or jump it. If there is no fencing, each rabbit should be worked on harness on leash. 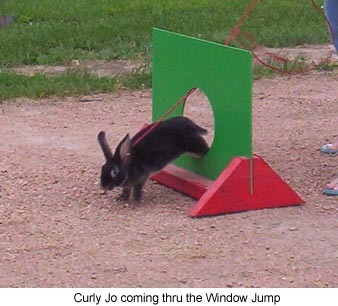 Many of the pieces of rabbit agility equipment have been designed for the rabbit to crawl or climb on (window jump, balance beams, tire jump, to name a few). 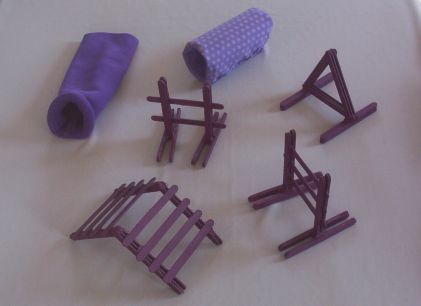 All of the agility equipment pieces and especially the types the rabbit's will crawl or climb on need to be sturdy enough to hold a large rabbits body weight. Please make sure that the equipment you build and or buy will NOT tip over as your rabbit tries to manipulate it. 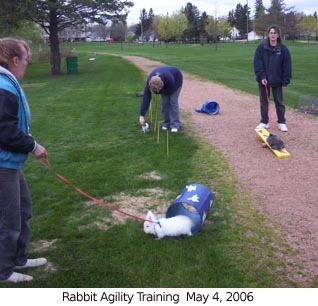 The following agility equipment sizes are set up for small to large rabbits. You might want to adjust sizing for specific breeds or if you will be running size based classes at your event. We recommend construction all equipment out of materials that can be wiped clean. You will need a hoop that is 10" to 18" in diameter and approx 1" thick. It can be made of wood, plastic or fabric. However, if it is made of fabric there will need to be four (4) exact replacement hoops for competition in case one or more rabbits urinate on the fabric. 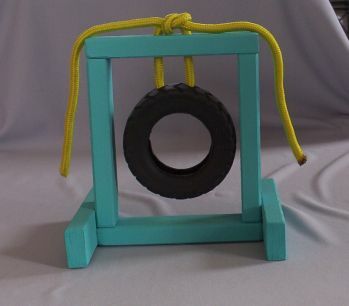 The frame holding the hoop can also be made of wood or plastic. All wood items must be painted or shellacked. The frame will be " X " and made to be sturdy and very balanced so that it will continue to stand even if "hit" by the rabbit as the rabbit comes thru the hoop. The Teeter Totter is a smaller type of Sea Saw. The top board is approx. 9" X 30" and it pivots on a round piece of PVC or couplings that is 2"-4" in diameter and 9 1/2" long. The top board is secured to the PVC by first gluing then tacking with small tacks from the board side down. Paint with non toxic water proof paint and decorate if desired. 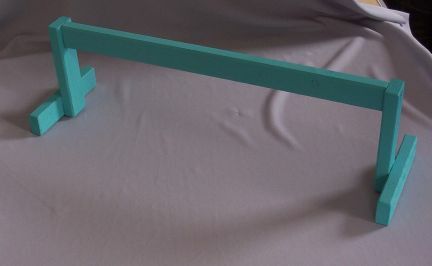 The Teeter Totter shown is 6 1/2" x 46". An Open Tunnel can be made of plastic, fabric over plastic or PVC piping. The size must remain consisting throughout the entire tube. with no collapsible parts. If fabric Tunnels are used there shall be four (4) exact replacements on hand during competition. The opening must be a minimum of 8" and maximum of 18". It should be approx. 18" - 30" in length. The outside may be decorated if desired. 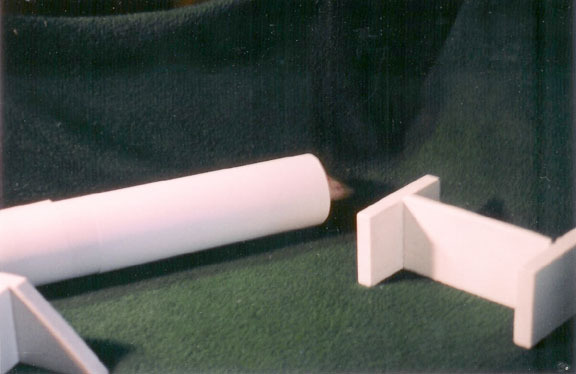 The Open Tunnel pictured has a 12" diameter opening and is 17" long. A Closed Tunnel can be made of fabric, tarp or "quiet" plastic, but it must be washable. A piece of tarp is recommended. 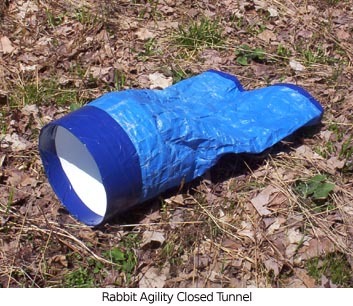 If a fabric closed tunnel is used in competition there must be at least four (4) exact closed tunnels available for the rabbits to use. If rabbits soil one another can be used. A Closed Tunnel must have a "stiff" opening that is 8" to 12" in diameter with a 18" "drape" that is one piece that flows out from the opening. The drape can be sewed or taped but must be made into one piece. There are five weave polls that are set in a foundation board for stability for indoor use. The polls are a minimum of 12" tall and are set approx 18" apart. Wooden dowels are suggested for the use of weave polls. Weave Polls may be pushed into the ground for outdoor use, however the minimum of 12" must still be present out of the ground. 18" or long polls are recommended for outdoor use. A wheel barrel tire or small vehicle tire on a standing wood or plastic frame. The frame can be made of wood, plastic or fabric. However, if it is made of fabric there will need to be four (4) exact replacement hoops for competition incase one or more rabbits urinate on the fabric. 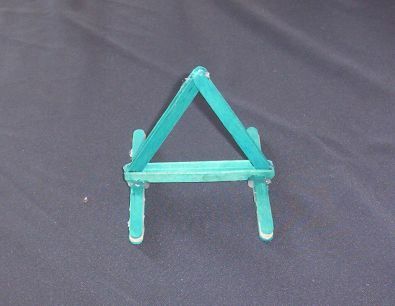 An A-Frame is made out of two pieces of wood, 12" wide x 24"tall each. 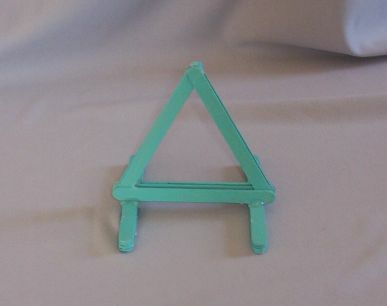 The two pieces of wood are hinged together so that the angle can change and there is a chain that will make the X on the A that will adjust the angle of the piece. The Balance Beam shall be 10" tall. The top parallel panel shall be 18" long. The ramps are set at 30 degrees and must have grip for the rabbit to have traction. Grip can be sand painted, strips of plastic with ridges of slats of wood placed approx 4" apart. The pause table should be 6" tall and the table top should be 12" X 18". The legs should be set to give the table the utmost stability. A wooden box without a bottom is highly recommended with 6" tall sides. All wood must be painted or shellacked. Decorate if desired. The Window Jump is a three piece wood item. The wood for the window to be cut out of is The hole for the rabbits to go through is 6" from the bottom and 4" from each side. The hole itself is a 10" diameter hole. On each side of the window a piece of wood cut to and glued and/or nailed to the window so that they are centered and will steady the window for the rabbit to climb, hop or jump through without knocking the piece over. Guinea Pigs can run agility courses. They are not jumpers though and the equipment pieces need to be wide and low to the ground. The pieces also need to be heavy duty for the size of the Guinea Pig. We will be making and adding photos of Guinea Pig/Cavy Agility Equipment soon, check back! !